What looks like magic (well, this text was written in 1997!) is achieved by the following procedure: With a computer tomograph (CT) and the help of x-rays, a series of continuous cross-sections is recorded. This series of pictures is saved on a computer as an image volume. 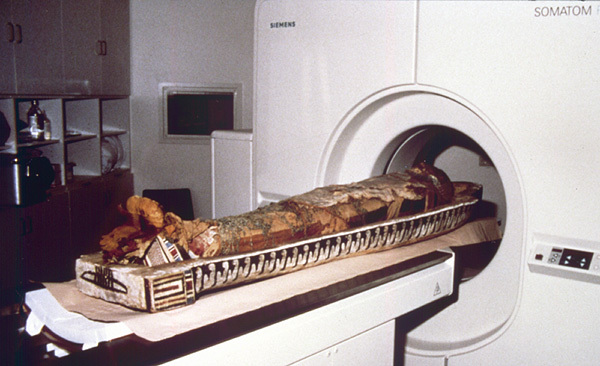 From this image volume, perspective views can be extracted, like it is demonstrated with the mummy’s head. As can be seen later, it can be viewed from arbitrary directions, and its components like the linen cover can be removed and restored. The unwrapping on screen, therefore, is non-destructive. Since images have been generated with an x-ray technique, the original color has naturally been lost. The color you see on screen is artificial. 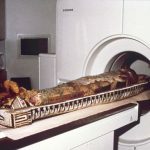 In return, the mummy is “intelligent”: With the procedure developed in Hamburg, information about objects can be saved in a way which makes it possible to access them in context on screen. For example, an observer can click on a certain part of the image to obtain information about the chosen area. This function, though, is only available in the exhibition and not yet on the web. The method described is very complex in development and execution. Ten million volume elements have to be processed to create a new image. For a user not to have to wait to long, a very potent computer is needed (a UNIX workstation of higher performance). The program used in the exhibition is, therefore, a simplified version, where ready-made image sequences can be called by the the user. This version is also used for the Voxel-Man 3D-Navigator interactive atlases of anatomy and radiology. The computer tomographical recordings have kindly been made by the Radiological Clinic of the University Medical Center Hamburg-Eppendorf.